The time: 1980. The place: New York City. While clubs in the Bronx and Brooklyn were still emerging from their post-disco hangovers, a new sound was beginning to take its place: Hip Hop. 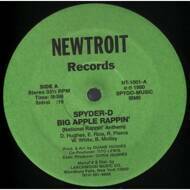 Spyder D's "Big Apple Rappin,'" released on Newtroit Records, epitomized the style of this new generation, featuring a simple yet instantly memorable and danceable groove paired with Spyder's slick raps dedicated to his hometown and delivered with distinctly New York attitude. Reissued in a fully licensed fresh pressing, this iconic 12" captures the Hip Hop movement in its nascent days: fun, fresh and ready to party.